Early morning by the NOC gear shed and a bald, bearded man I came to know as Nick easily shouldered a kayak. I was there to write about injured veterans, and having read about these programs, I'll admit I stood there expecting some outward sign of pain. But Nick was laughing and calling himself Thor. I laughed too, both at his jokes and my own expectations. Where I'd expected sadness I'd found laughter; I didn't even know I carried that stereotype until he'd shattered it. Here's another idea worth shattering: being outside isn't just about having fun. I know, I know. Look at any NOC billboard and you'll see the usual taglines: Fun, relaxation, and family. All true. But what is rarely advertised is healing, the notion that one's life can change through contact with the outdoors, and it's actually one of this company's founding principles. For decades many groups have come here for healing; recently it was Team Semper Fi, who is sponsored by the Semper Fi Fund, a nonprofit organization that provides support to post-9/11 military veterans who are wounded, injured, or critically ill. They were here for three days of hiking, zip lining and kayaking, and I was joining them for their Introduction to Whitewater Kayaking Course. According to Jeff Steffen, Sports Director at Semper Fi Fund, they run about 45 trips a year to get veterans outside and "comfortable doing a new sport." Once comfortable, they'd have a reason to leave the house, get active, and meet other peope. Those three things may sound like obvious components of happiness, but that's because most of us take them for granted. Many of these veterans told me that these three basic things (leaving the house, getting active, finding friends) were significant barriers to their daily lives. For some reason, few articles on veterans talk about isolation, probably because it doesn't make a good photo-op. The truth is that while some lacked limbs and a few mentioned being in pain (though this was rare - the vibe I got all day was pure stoicism), for many the issue was isolation, that they'd been retired early from the military, and still injured, spent long days alone at home. The first to clue me in was James, who approached me at Fontana Lake. He was nice and easy to talk to, but he mostly stood apart from the group. I'd noticed him when we were sizing helmets. Asking for a large, he'd said "I have a lot of knowledge but I can't remember all of it", a joke I didn't quite get until someone later told me that many of them had TBI (Traumatic Brain Injury), so they constantly re-introduced themselves and told the same stories. Today was the anniversary of James' mother's death. "She was my rock," he said, and after she passed, he'd stayed in the house and avoided everyone. Thanks to Semper Fi Fund, this was his first time really leaving the house in a couple of years, and as he took in Fontana Lake, he said it was a good way to commemorate his mother's passing. Like many NOC Instruction Clinic guests, this group started timidly. Kayaks rock, even on flatwater, and tend to go in circles. It can be frustrating and makes you get tense even when you know you should relax. But by lunch time, I noticed a shift in the group's tone: people were more animated, lively, woken up by being flipped upside down to wet exit. A couple even asked if they could learn to roll. Andrew Wilmot, a veteran NOC instructor, started with a stock answer: "Well, these clinics are just the basics. We don't really have time for..." He stopped, looked at the man requesting to learn, then at the other instructors. None of them said anything more, but I could see the decision being made. NOC Instruction is known for adapting, and even though they had a schedule, Wilmot smiled and said, "Come to the shallows," and in just a few minutes, he had a once-timid paddler rolling. That student later told me that today's pain was about a 7, but he wasn't complaining. He was, in fact, smiling. After the trip, I couldn't stop thinking about a man named Kemmini, who had prosthetic legs he covered with a digitized camouflage pattern. All day, he'd depended on a walker, a cane, and his wife, Tomesha, to maneuver himself to the boat. After he'd done his wet exit, he'd had to drag himself by his arms to the shallows, and then he hoisted himself back into his boat and tightened his spray skirt. He did all this without complaint, and we all realized at the same time, I think, that he was going to wet exit again. Tomesha shook her head. "You're not really going to do it again, are you?" Later he told me how tired these days made him, and I wonder what that wet exit had cost. 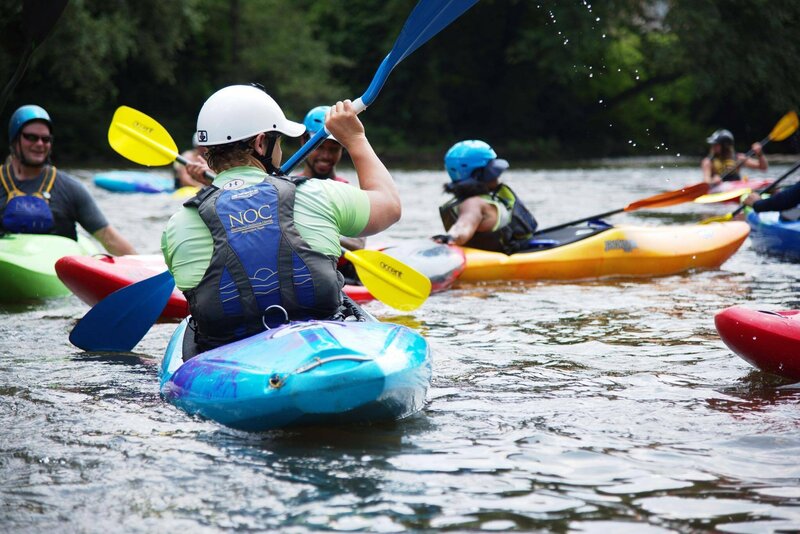 Because for most of us, kayaking is a vacation from self and daily worries, but for a lot of these veterans, that vacation is short-lived, and I imagine it's punctuated by the reality of what's waiting for them when the trip is over. So while I know the outdoors can heal, I also know that healing is relative and a couple days of paddling is not a magic pill, especially for someone with a lifelong injury. But this doesn't seem to bother Kemmini. At the take-out, he told me, "I'm just here to get the most out of this while I can," and in his voice I heard something I'd never expected: gratitude. That's when I realized that Team Semper Fi's mission was realistic and working in a very real way. They'd purposely chosen NOC, who regularly works with such groups, for its professional instruction and its ability to adapt to the needs of each group. As Jeff Stefen had told me, this course was an introduction, an invitation to engage in something new. Team Semper Fi knows better than anyone that healing takes time and work, but they believe in these trips as a chance to allow these veterans to regain their confidence, and that the outdoors is a space for new beginnings. New beginnings. I heard that a lot from the participants I talked to. That's something the NOC has always tried to provide, and from the stories I heard, I'd say it's still working.